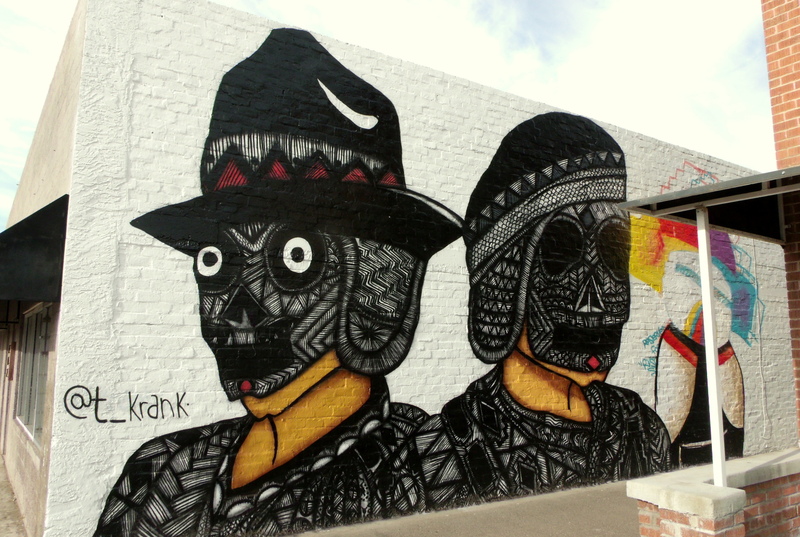 You might remember that we met this artist almost two years ago in my post titled, “Cabezas Curiosas.” It appears that Tyson Krank has been busy again…. 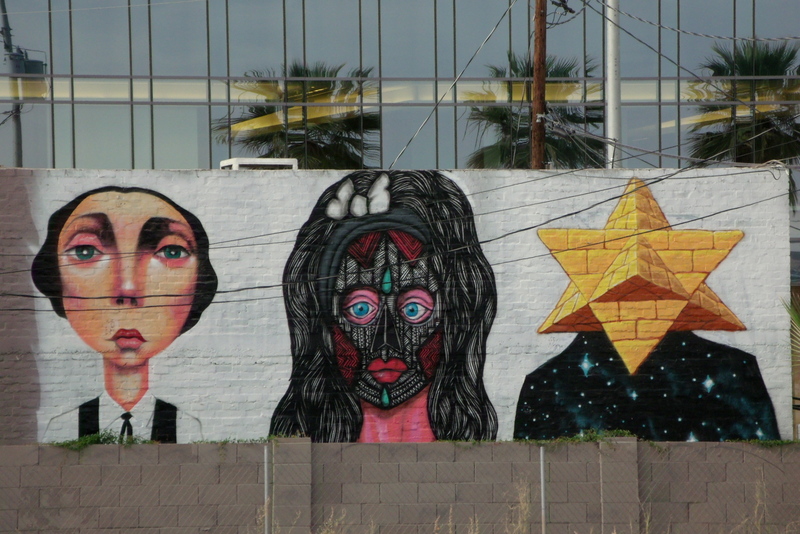 I happened to drive through the alley behind the Laird Apartments, at 317 West McDowell Road in Phoenix, a couple of months ago to take another look at the Southwest Goddess mural that I shared here in February, 2015. What a nice surprise to find this bit of a treasure just waiting to be appreciated. The time of day brought the shadows of the power lines, as well as the over-brightness noticed on the right half of the above image…. 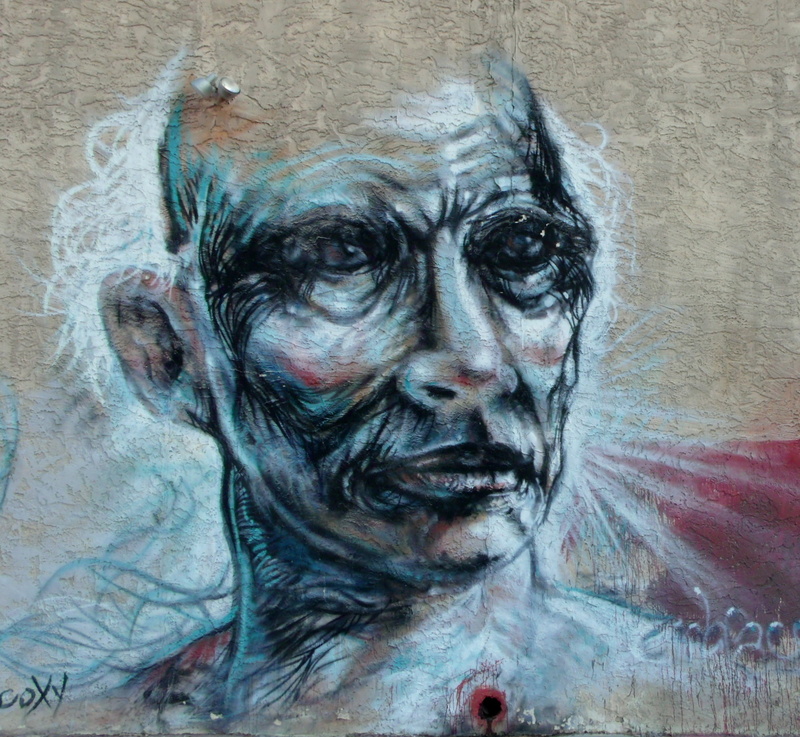 Eyes like dark pools…..fantastic detail wrought with spray paint. 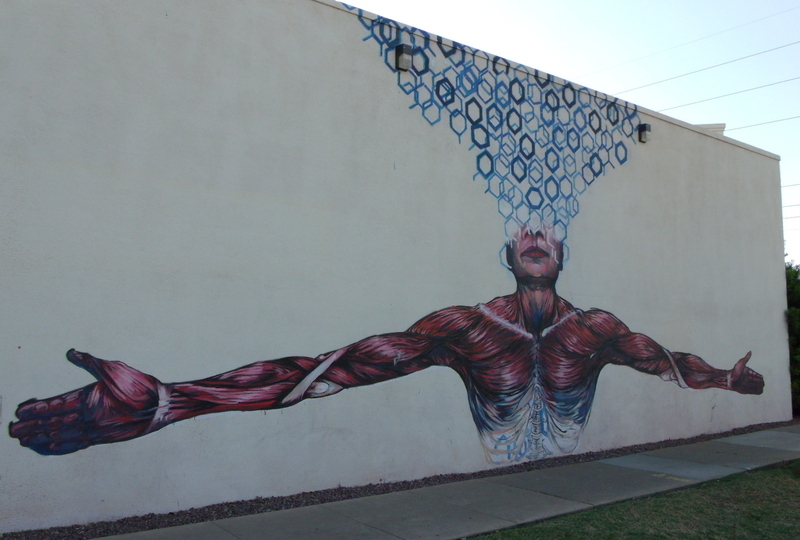 If you’d like to see more posts on street-art/building murals, you can scroll to the bottom of the page and click Street Art – Graffiti under the Categories widget to see more posts containing images of artwork from both Phoenix and Salt Lake City. 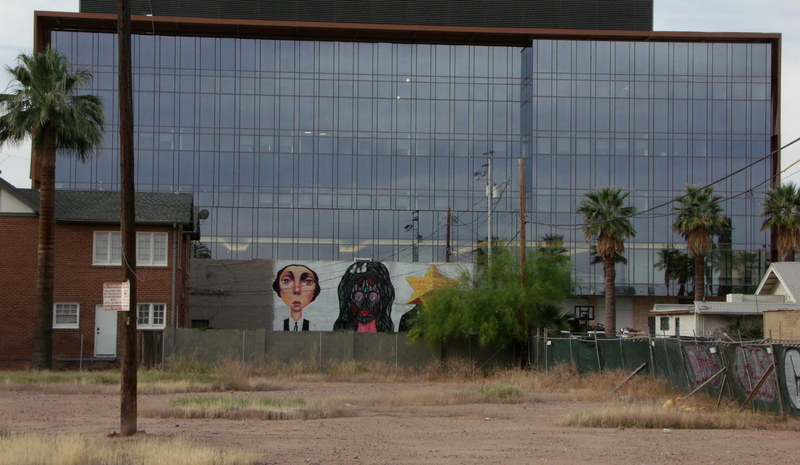 I found this mural “under construction” back in April or May of 2013 and have been driving past it a couple of times a month since, hoping to find the parking lot unoccupied and the building not drenched in overly bright sunlight. 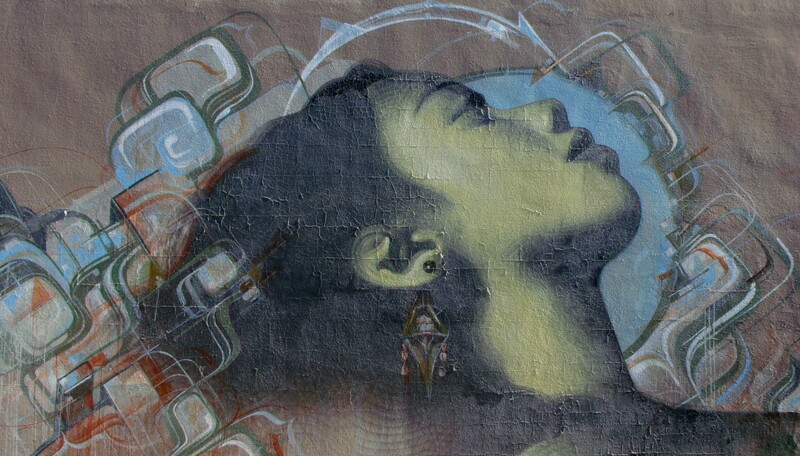 Finally, last weekend, I happened to find the mural with both of those conditions met, so here it is. I’m not sure who the artist is, but it is probably the same one who created the mural in City Paint 9 – Oriental Furniture, as the style seems to be a dead-match. 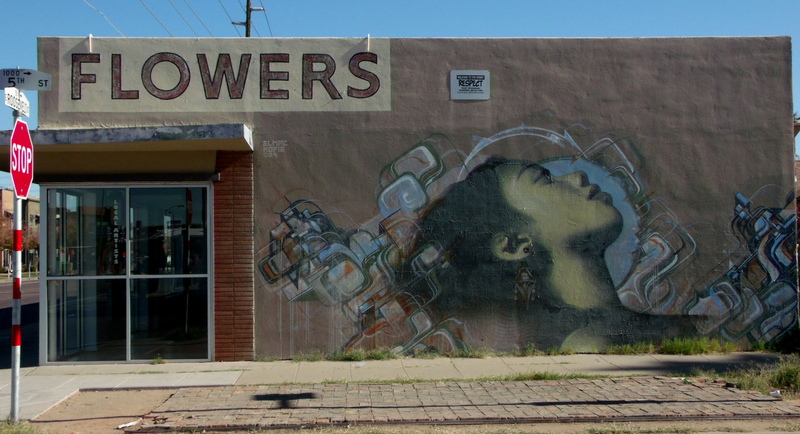 You might remember Gallenson’s Gun-shop from the Five on Five western mural that I featured in City Paint – 6 through 6.5. 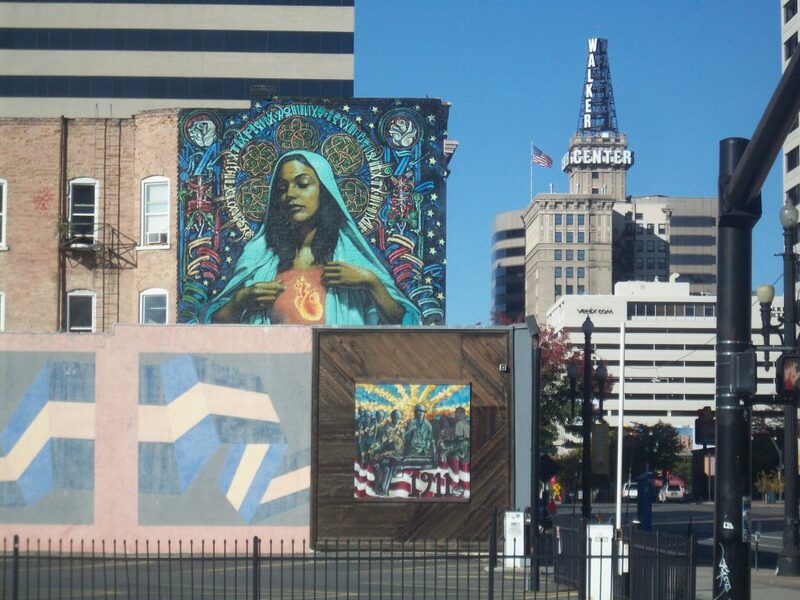 That mural is located to the far left of this one on the perpendicular wall at the south end of the rear parking lot. 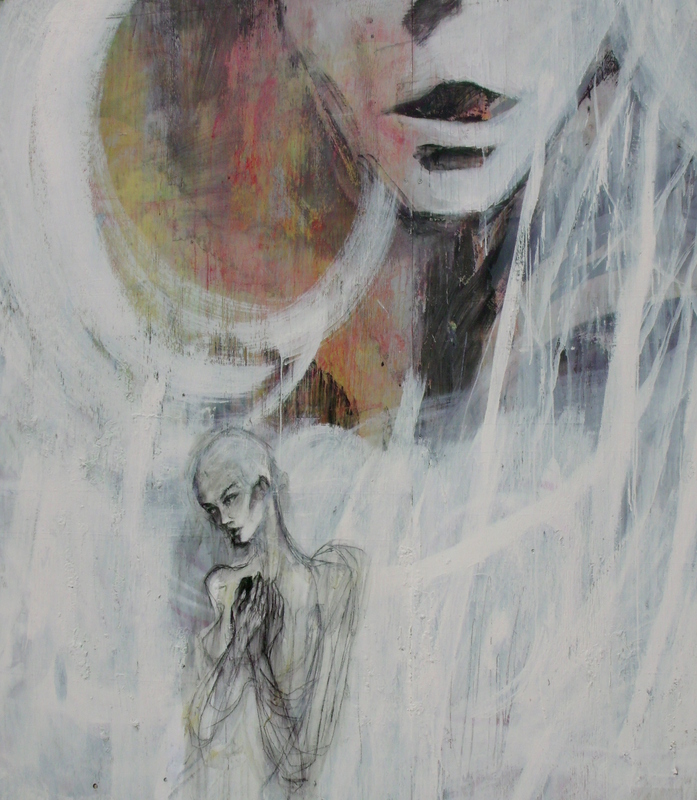 Anyway, here it is…rather busy for the eyes, but it’s pretty awesome at the same time. 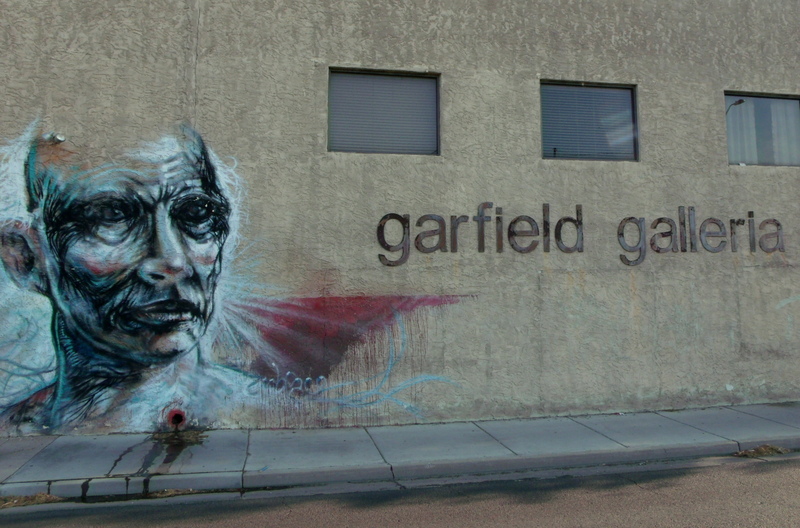 And remember, you can click on any image to be taken to a gallery where you can view each photo in greater detail…and if you’d like to see more posts on Salt Lake City’s street art, you can scroll to the bottom of the page and click on Street Art – Graffiti under the categories widget. 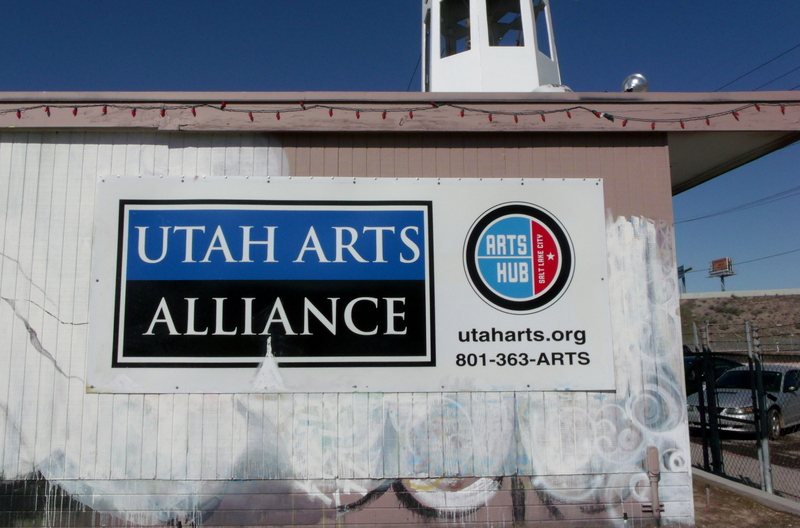 If you remember the City Paint post about the Urban Jungle, you might recall that I mentioned that I was allowed access to the property by “someone nearby;” this happened to be the staff at the Utah Arts Alliance (UAA). Before I ventured over to make the photos of the jungle scene on the adjacent lot, I took advantage of the opportunity to capture some photos of the murals that the UAA had on the side of their building. I couldn’t find any artist information for the next two panels. They measure somewhere around 10 x 10 feet square and are on the building just to the left of the above image. This next one looks like it belongs in a gallery somewhere…can you imagine creating it on the side of a building and then leaving it out in the elements of the weather? I didn’t speak with the arts alliance staff about the following gallery, so I don’t know if they’ve even properly titled it, but I refer to it as the “Legends” mural because of the status of the personalities shown…they are singers, composers, actors, philosophers, authors, scientists, and even social activists. 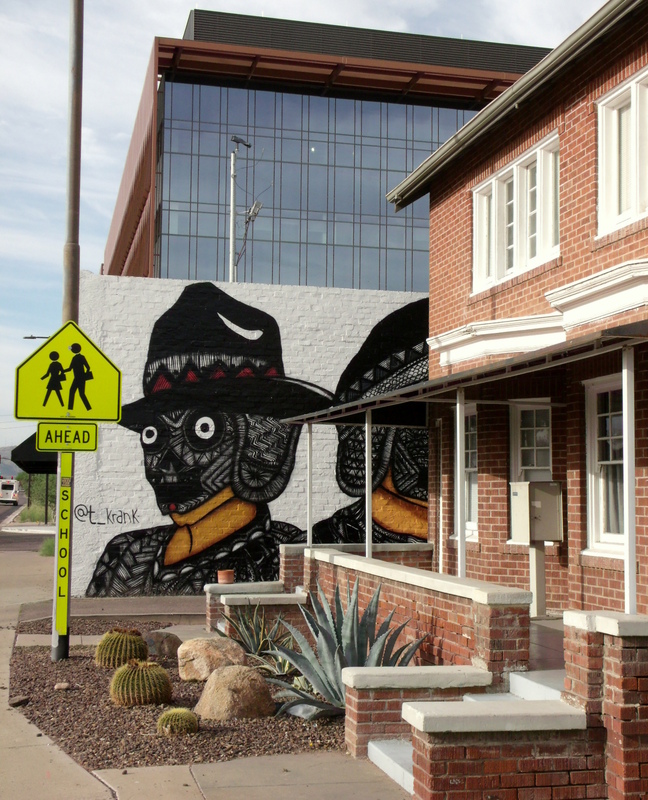 The mural was painted by a street art duo known as Weird Chief. If you’d like, you can click on their highlighted name and be taken to their web-site to read their bios and see more of their work. And lastly, this is what the mural looks like complete…minus the “far right” panel that is actually on a smaller segment of adjoining wall that is just off-frame to the right. 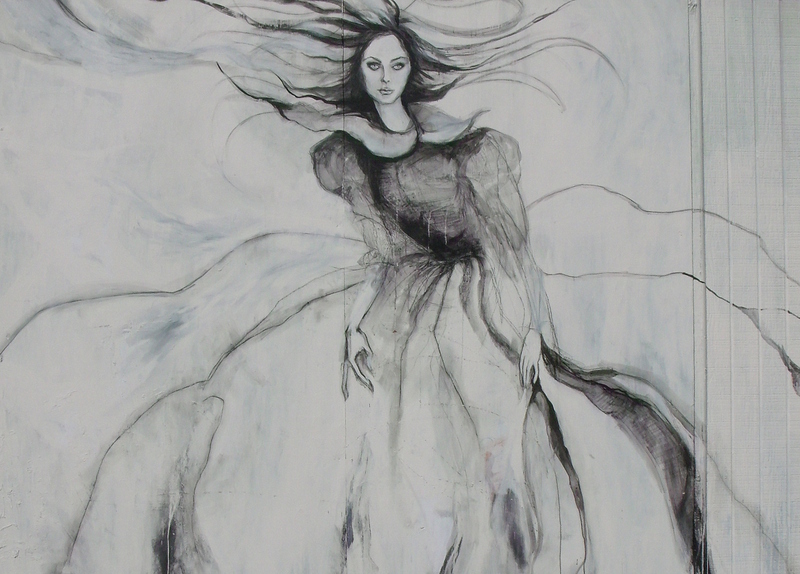 If you’d like to see more examples of Salt Lake City’s street and building art as I’ve presented them in this City Paint series, you can scroll to the bottom of the page and click on the “Street Art – Graffiti” category to be taken to a continuous feed of the earlier posts.